Fabulous gallery and well worth a visit! Reception Sun. Sept. 16, 11:30 to 2:00.
techniques, elements of composition, and other surprises. Join me the second weekend of May, from 11:00 - 6:00. Plenty of red balloons and signs will mark the spot. 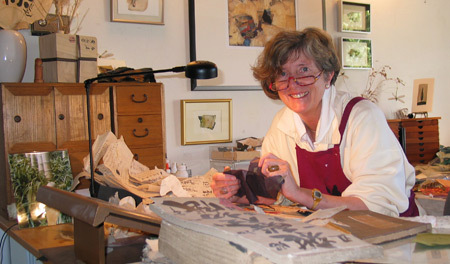 All-day workshops with fun exercises, collage technique, elements of composition, and other surprises. but for those who can’t make the trip, please see below. Stop by my studio in Mill Valley to see the new work for Stremmel and celebrate with a glass of wine. Featuring my new Silver Series and dozens of other new pieces. Join me the first weekend in May, 11:00-6:00. Lots of new work: collage on wood, Chiisai “miniatures”, triangular scrolls, collage cards, and limited edition prints. You can also try your hand at making a collage card with my papers, old books, and other treasure. Plenty of signs and red balloons will mark the spot. Do stop by! I and 150 other artists have donated pieces related to books and all will be auctioned off, a silent auction until the 25th and then live. Plenty of bargain opportunities! Art Walk Receptions on Friday March 8, April 12, and May 10, 5:00-8:00. You can also stop by most days, Tuesday through Saturday. Open Studio, 150 Shoreline, Mill Valley, 11:00-6:00 Sat/Sun, balloons mark the spot. You can also visit the Open Studio Gallery at 325 Town Center, Corte Madera, to view one piece by each participating artist.